An early morning start was had one sunny Saturday morning and by early I mean crack of dawn stuff, none of this sleeping in late business. However, the end result was well worth it, although the next few days stiff body might indicate that I need to do this more often. We went up Lion’s Head, something I haven’t done in years. And I think the reason I haven’t done it is because I was absolutely terrified of the chains in one section as you go up. Last time I did that I was stuck halfway up the chains with that deer caught in headlights look. I don’t actually recall if I made it all the way up – the trauma of it all has clearly blocked it out of my mind. Speak to most people and they tell you the “chain” section is a breeze and I totally think that’s cool, but something about it sends fear into my core. So I prefer the longer, but never the less superbly scenic, route up. Which is the route we chose, after my friends saw all of the colour drain from my face when asked which route to take. Smart and very caring friends I have. On the way up we bumped into a number of people who were on their way down who were all spewing words of encouragement and how we were nearly at the top (all lies of course), because if you’re as unfit as me you will be struggling at this point. I made a mental note not to be one of those super encouraging people on the way down – woops total fail on my part I was all “you’re nearly there”, “just a bit further” and all that jazz on our way down. The hardwork to get to the top is 100% worth it because the view is something that is pretty spectacular. Especially on a clear day. What an amazing city I live in. I really need to go and do this hike a bit more often. Who’s keen to join? 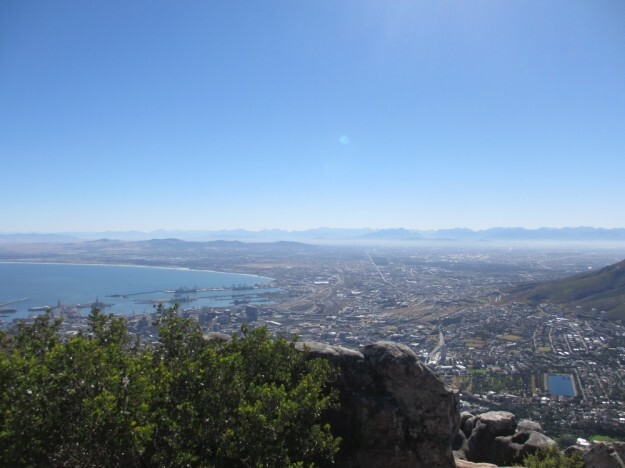 This entry was posted in Play and tagged beautiful views, cape town, exercise, friends, my city. Let’s doooooo it! I’m super extra keen!! Ha! Ha! Ha! I can’t remember who it is now, but some guy I know used to run up Lion’s Head before going off to work in the morning – and he started work at normal office hours, not at midday.